Shada is a rather special book. And this is true not just because it finally brings a lost, unfinished and untelevised story officially into print, but also because this new version is a startlingly transitional, connective tale. It seamlessly bridges different times, incarnations and conceptions of Doctor Who – all rather fitting for an epic story concerned with the creation of a “Universal Mind”. First, there's the question of authorship. Pondering whether or not Roberts has been faithful to Douglas Adams' screenplay rapidly becomes a pointless exercise: this is not a slavish reproduction, but a careful, creative transformation of different scripts and performances. Rather than a zero-sum game of authorial control, this is a cunning blend of Adams and Roberts, and a veritable meeting of minds. Certain moments stand out as strongly characteristic of Roberts' authorial persona and concerns – for example, Chapter 9 challenges the representational limitations of 1970s' TV Who, at the same time making new sense of a fairly throwaway moment in Adams' script. Something else which betrays a Roberts-esque preoccupation is the joke that villainous Skagra has a habit of reducing people and worlds to a contemptuous, dismissive score out of ten. Where, I wonder, did Doctor Who fan Gareth Roberts seize on that activity as a comedic motif for sociopathic evil? And Skagra obsessively collects and orders his books, not wishing to touch them with so much as an ungloved hand. Again, what could have inspired Doctor Who fan Gareth Roberts' specific take on Adams' cipher of a baddie? One might almost imagine that this Skagra is a humorous attack on certain strains of fandom: the story-scoring Who fan/collector not so very playfully rendered as monstrous. This fan-villain connection is made even more explicit when Skagra researches his adversary, the Doctor. Whereas the video of Shada includes a brief montage of clips from assorted Tom Baker stories, Roberts has Skagra watching complete “video-texts” of The Androids of Tara, The Power of Kroll, and Creature from the Pit. He curtly dismisses them as evidence of “a 1 out of 10 Time Lord larking about on 2 out of 10 planets” (p.71). Skagra is evidently unimpressed with the Graham Williams era, and his ultimate fate – which I won't fully reveal here – will also be strangely familiar to fans of the BBC television series Doctor Who (p.379). At the same time that Roberts seemingly reworks Shada as a vehicle for his own loves and his own pet peeves – not to mention fixing the story so it makes much better sense – he also rigorously pastiches Douglas Noel Adams. The DNA of Adams' style is present in many ways: in Roberts' riffing on the obsequious, worshipful character of the Ship, in the rhythmic repetitions of sentence structure, and even in a sprinkling of shocking puns and self-referential tributes. Given that Professor Chronotis owns H.G. Wells' The Time Machine in Shada's 1979 scripts and recorded footage, incorporating real-world bookish references is very much in keeping with the spirit of Adams' story. That said, it doesn't take a vast imaginative leap to guess which SF book is identified and nearly name-checked this time around (p.392). The Panopticon Archives, we eventually learn, have long been home to a particularly appropriate tome... Oh, and the newly renovated end to episode five (or part five, in literary terms) also feels very much like a Douglas Adams-ish gag. It relies on typography, could only really work on the printed page (p.328—331), and is quite possibly the rudest, funniest episode ending Doctor Who has (n)ever had. As well as skilfully bridging and harmonising the authorial voices of Adams and Roberts, Shada is brilliantly transitional in other ways. It re-writes 1970s' Doctor Who from the perspective of BBC Wales' Who, incorporating cheeky references to the gender-switching Corsair (p.83), to red-robed and henna-tattooed visionaries (p.232) and even to Roberts' own creations, the Carrionites (p.312). It also gives Clare Keightley and Chris Parsons an already much remarked upon romance, in keeping with contemporary Doctor Who's newfound emotional realism. To my mind, Roberts also toys with Shada's status as a story originally bookmarking the end of the Graham Williams era and the conclusion of season seventeen. When Doctor Who next returned to television screens it was as a rather different creature – a John Nathan-Turner/Christopher H. Bidmead confection. And Roberts marks this turning point by picking up on mentions of entropy in the available Shada scripts (e.g. on p.106) and vigorously extrapolating. Thus he works in further references to “accelerated entropy”, with Chris Parsons querying this as a scientific possibility (p.250), as well as developing Skagra's plan to “conquer the threat of entropy” by overcoming the second law of thermodynamics and ensuring there could be “no collapse into eternal darkness and decay” (p.346). Nobody mention it to Christopher Bidmead, but Skagra's evil scheme sounds uncannily like a mission statement for season eighteen, creating a clever subtextual blurring of season seventeen and its successor, and prefiguring the Nathan-Turner/Bidmead era... albeit with Christopher H's pseudo-science (and Logopolis) implicitly repositioned as, well, errrrm, utter madness. Although the Doctor protests that he isn't free to travel up and down “the Gallifreyan timeline” (p.83), Roberts permits himself just that pleasure, hybridising “classic” and “new” Doctor Who to reinforce the contemporary party line – namely that it's all the same show. But perhaps it's never been quite as wholly unified as this. 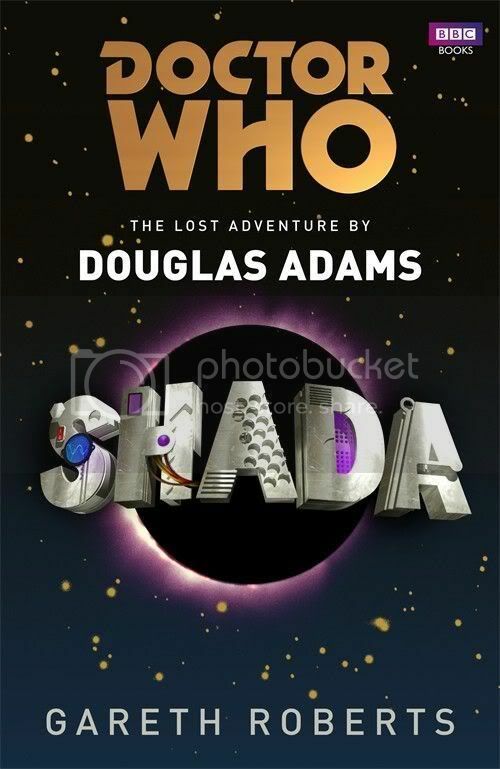 Shada represents Doctor Who's own “universal mind”: past and present, “classic” and “new”, Adams and Roberts, seasons seventeen and eighteen; all are merged together into one great outpouring of fannish passion and literary grace. This revisitation of a 1979 story will no doubt be a strong contender for the Who book of the year in 2012. Good writing, much like time travel, can achieve strange and beautiful and intricate things. Gareth Roberts would probably like his readers to consider the possibility that scoring things out of 10 may be a bad idea, and – whisper it – a tad unhealthy. This is a shame, because I feel compelled to tell you that Shada is very definitely a 10 out of 10. Indeed, it's a pity that BBC Books haven't issued a Collector's Edition (its cover designed to resemble The Worshipful and Ancient Law of Gallifrey), complete with Seal of Rassilon-branded reading gloves. Fandom, in touch with its inner Skagra, might just have enjoyed such merchandising. But no matter, because this retelling of Shada remains a rather special book. No, more than that, it's a very special book.